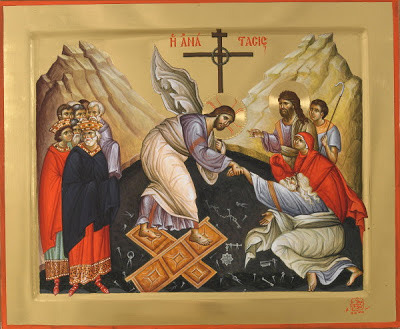 Descending into Sheol, Christ revives the dead, tearing the tombs open and leading the dead out of the nether regions. [T]here is a... struggle between Christ and Death. The latter rushes to close the gates of Sheol in the face of the Divine Visitor. Death is struck by the fact that, unlike all others who strive to escape from Sheol, Christ wishes to enter it. The medicine of life has entered Sheol and restored its dead back to life. Commenting on the hymns of St. Ephrem the Syrian, Archbishop Hilarion Alfeyev, Christ the Conqueror of Hell: The Descent into Hades from an Orthodox Perspective, p. 107.